North Carolina is naturally as pretty as a postcard. Still, finding a way to share that beauty with the rest of the country took some effort. Really, we’d prefer not to brag. In our humble opinion, the virtues of North Carolina should go without saying. But as it turns out, not everyone knows that our state is more than just another Southern stopover on the way to, say, St. Augustine, Florida. We have to trumpet to the rest of the country that we have mountains, beaches, and golf. That we have the highest mountain east of Pikes Peak and the second-longest coastline on the East Coast. That we’re the birthplace of Virginia Dare, the first in flight, and a bastion of barbecue. All attributes, dare we say, worth bragging about. After World War I, as roads improved and society became more mobile, North Carolina officials began to do just that, in an effort to plug the state as a destination. The lives of many people in Depression-era North Carolina weren’t the grist for glossy brochures. Although it was the most industrialized state in the region, North Carolina was still vastly agrarian. In a cruel irony, cotton and tobacco flourished, but there was such a glut that prices nosedived, and farmers couldn’t make enough money to feed and clothe their families. Yet at the same time, people of means were getting in their Hudsons and Packards to take vacations. With these two contrasting Americas as a backdrop, state officials wanted North Carolina on the forefront of the tourism trade. To a limited extent, leisure travel had already existed for a long time in North Carolina. In the antebellum era, wealthy planters from South Carolina escaped the heat and malaria of “fever season” in places like Flat Rock and Cashiers. By the 1920s, North Carolina had begun developing parks and infrastructure to encourage leisure activities. The Good Roads Campaign of the early 20th century set off a riot of road building. In 1934, Great Smoky Mountains National Park was chartered. In 1935, construction began on the Blue Ridge Parkway, carving out a postcard-ready road through the mountains. Later in the decade, the National Park Service acquired land on the Outer Banks for the Cape Hatteras National Seashore. “To do a nationwide marketing campaign, they had to come up with a way that would not privilege one section of North Carolina over another, or they wouldn’t get it through the legislature,” Starnes says. Thus the word “variety,” which encapsulated the state’s varied landscapes and climates. During those early years of the campaign, tourism funneled about $50 million a year into the state’s economy, more than the entire return of the cotton crop and a third of tobacco proceeds. This promotional crusade involved running ads in national publications, splashing the state’s name on billboards, publishing colorful guidebooks, and producing feature-length films financed by the R.J. Reynolds Tobacco Company. In addition to the films, the state hired advertising firms to design annual booklets filled with summaries of the state’s regions, climate, history, and must-see places to visit. The pages brim with pictures of pretty scenery: golfers at tee times, horses at the steeplechase, and mountains at leaf-peeping season. Enhancing that traction was the late Hugh Morton, the photographer, conservationist, and ambassador of North Carolina. In the 1950s, he inherited more than 4,000 acres on Grandfather Mountain, where he built the Mile High Swinging Bridge, one of the most spectacular destinations in the Southeast. 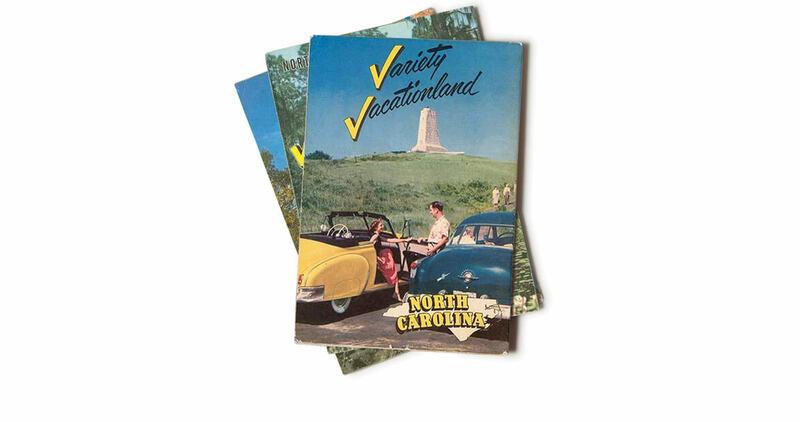 For decades, Morton captured North Carolina’s beauty in photographs, many of which colored the pages of “Variety Vacationland” literature. 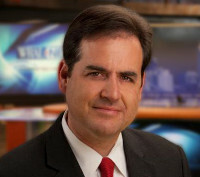 Starnes writes that Morton understood how resorts must constantly evolve to keep visitors coming back, and work together to promote a singular North Carolina image. “Tourism is an industry that individual businesses both compete [with] and rely on simultaneously,” Starnes says. The leisure business also led to the preservation of our historic landmarks. Take Old Salem: It emerged as a tourist attraction in the ’50s, with Old Salem, Inc., using tourist dollars to refurbish and maintain the buildings. The Biltmore Estate? Those iconic lighthouses? They were all protected not only as an homage to our heritage but also as a hook for out-of-state sightseers. These days, we have casinos, theme parks, big cities, and Mayberry. And we still have our timeless beaches and mountains and field-and-forest scenery. Not that we want to brag, but as Southern states go, North Carolina is unrivaled in diversity, beauty, and culture. But that’s just our humble opinion.